A young adult book blog where I read and review the books I like - and then maybe some that I don't like. Like so many times before – I let the hype surrounding a book halt my reading of said book. Cinderis a book that basically everyone has raved about since it’s initial release, and then when the sequel was released? All I would see is Cinder-this, Cinder-that – and it’s not a bad thing, it just put me off the book because I didn’t want to be disappointed. And oh my goodness! I’m so happy that I took so long to read Cinder – it was a little slow at first, but I ended up really enjoying it. The thing about Cinder, is that the plot is predictable. From the beginning, you’ll know where the stories headed – sure there’s a few twists here and there, but nothing too drastic. And while that would have normally bothered me to no end – with Cinder it just works. The way Marissa Meyer writes about this futuristic world is incredible. The story starts off a little slow, but once you hit that 60 page mark – you don’t want to set it down. I was reading like crazy and when I ran out of pages – you can only imagine how frustrated I was. Cinder was an amazing protagonist! She hasn’t always been dealt the best cards in life – what with being a cyborg and being adopted into a family where she’s thought of as a burden. 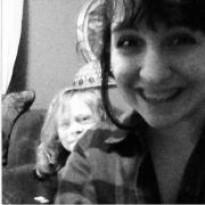 But she always looks on the bright side. Well, the realistic side. She knows that her life isn’t the best and she works through that. And then there was Prince Kai! AH. I can only say this – I wish that we’d have gotten to see more of him in the book. The moments between him and Cinder were incredible and I cannot wait to see their relationship progress in the next book! 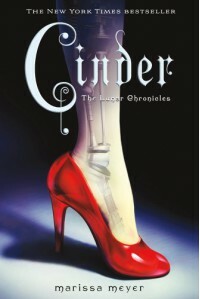 Cinder is a retelling of one of my favorite fairytales, and it definitely doesn’t disappoint. I wasn’t expecting to love this book as much as I do, and that’s the best feeling in the world! Thinking you won’t enjoy a book and then loving it. I cannot wait to read more about this futuristic world that Marissa Meyer has created.